We’re Newmarket’s leading window and door installation and replacement company. We specialize in vinyl windows, entry doors, siding and masonry in Newmarket, Barrie and Simcoe County. We’re Newmarket’s leading window and door installation and replacement company. We specialize in vinyl windows, entry doors, siding and masonry in Barrie, Newmarket and Simcoe County. Newmarket continues to build its reputation of being one of Canada’s most progressive environmental leaders. As such, Newmarket secured Canada’s first “green” subdivision, featuring “green” homes that focus on the efficient use of energy and building materials. Be part of the green movement in Newmarket by investing in high-efficiency windows. A brand new set of energy-efficient windows will not only reduce heating and cooling costs, but also enhance safety and security, increase value, and update the overall look of your home. Awning windows are an energy-efficient and cost-effective window option for your home in Newmarket. These windows swing outward, allowing for enhanced air circulation while preventing rain and outdoor debris from entering the home. In Newmarket, awning windows are a popular window choice for the kitchen. Bay windows are a truly stunning feature for any home in Newmarket. A traditional bay window features three panels extending outwards on an exterior wall. The front panel is flat and parallel to the wall, with angled side panels on the left and right sides. The bright and beautiful alcoves that bay windows create can be enjoyed as a cozy reading nook or decorative green space. Bow windows are similar to bay windows by extending outwards from exterior walls, but incorporating four or more panels. The more window panels, the rounder the curve, providing softer angles and an attractive curb appeal for any home in Newmarket. Casement windows are a common and practical window choice in Newmarket due to their tight seal against cold and humid weather conditions. Casement windows will improve air circulation in your home while creating a sleek look when paired with modern window treatments. Whether you live in an older home or out in the countryside surrounding Newmarket, our team will provide you with the best possible range of window options, no matter the age or specifications of your home. As each window is tailored to accommodate any window shape or size, our expert tradespeople will ensure all windows fit seamlessly into your home. A double hung window will allow you to manage where air flow originates from in your home. As the two window sashes open from either the top, the bottom, or from both directions, a double hung window improves air circulation more efficiently than a single hung window. Single hung windows are easy to clean and operate, remaining a classic and popular window choice in Newmarket. The single hung window has two sashes, with the top sash fixed in place and the bottom sash able to slide up and down with minimal effort. Installing single hung windows will reduce your energy costs and increase your home’s curb appeal. Slider windows are built with one or two moving window slashes that slide horizontally on a track. As slider windows open and close with a gentle effort, they are easily maintained. Slider windows will allow a large amount of natural light to enter your home, which is particularly beneficial during the dark winter months. A unique and equally attractive window option, picture windows will allow you to experience Newmarket’s lovely views with ease. As picture windows do not open, they are extremely secure and energy efficient. 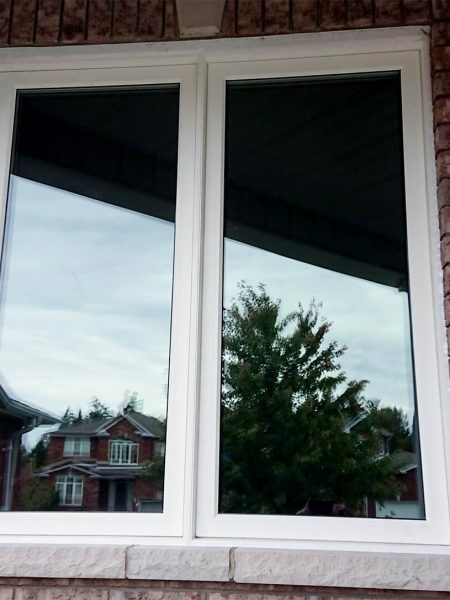 Picture windows also have no moving parts, so they become the easiest window to customize, making them an overall excellent window option for any home in Newmarket. Our team of professionals has completed exterior remodeling projects including window installation and replacement in the town of Newmarket for over 20 years. Our effective and proven eight-step window installation process is the catalyst to consistent and open communication between our clients and team. This process also ensures we routinely meet all anticipated timelines and budgets. Our expert window installers will ensure your replacement windows fit any existing opening, no matter the unique specifications. As no elements of the home’s exterior need to be tampered with, the process of installing replacement windows is quick. Due to our efficient installation time, window replacements are possible year-round in Newmarket, regardless of the weather. If you’re building or renovating a home in Newmarket, new construction windows will offer the most options when it comes to customizing window shapes and sizes. Our tradespeople collaborate with home builders to install new construction windows right into the framing of the home. At Weaver, we’re dedicated to hiring the most dedicated and talented tradespeople. We also offer all clients a unique, free of charge, lifetime warranty on all our products. As our team truly invests in the success of each project, we remain dedicated to providing our clients with a level of service that will surpass all expectations. I’m considering updating my home in Newmarket with a set of new windows. How do I receive a complimentary quote? By contacting a member of our team, we will schedule you a free in-home quote with one of our trained specialists. Do you offer new window installation during the winter months in Newmarket? If so, how quick can the windows be installed? Yes! We install new windows all year long. We typically complete window installations within one day. During the colder months, however, installations may take a bit more time as we are conscious of energy costs. What are main advantages of replacing the windows in my home in Newmarket? The main benefit of replacing your windows with a set of brand new energy-efficient windows is the savings you’ll notice on your heating and cooling bills. New high-efficiency windows also update the look of your home while increasing its overall value. What types of windows are most recommended if I feel a cold draft entering my home during the winter in Newmarket? Our team will cater to your home’s unique needs, providing you with the best range of options for windows or doors that are best suited for your home. New high efficiency windows will increase the energy efficiency and comfort levels of your home dramatically. If live in an older home in Newmarket, will new windows fit my home’s unique window shapes and sizes? Absolutely! We tailor each window to fit any window shape or size, while being masterfully fitted by our team of expert window installers. I live near Fairy Lake in Newmarket. What types of windows are most recommended for living in this type of setting? Any of our energy-efficient window options would be appropriate for homes located near Fairy Lake. The most energy-efficient window option that can open, however, are casement windows. If I order new windows for my home in Newmarket, how long can I expect the total installation process to take? We typically install new windows in Newmarket in as little as 5 weeks. There isn’t much natural light in my home in Newmarket. Are there certain window types that let in more sunlight? The window type that would let in the most natural light would be our picture windows. Picture windows are also the highest rated energy-efficient window option. Does siding or brick need to be removed when installing new windows in my home in Newmarket? In most cases, there is no need to remove any exterior elements of the home that are not associated with the window. What window options are the most cost-effective for my home in Newmarket? As we offer several window options to meet the exact needs of your home, we encourage you to contact us directly for your free, in-home estimate. Consistently named one of the best places to live in Canada by MoneySense Magazine, Newmarket is garnered as one of the most dynamic, diverse, and desirable towns to live and work in. Newmarket is also considered a progressive town with a reputation for environmental leadership. As such, Newmarket secured Canada’s first “green” subdivision – featuring “green” homes that focus on the efficient use of energy, water, and building materials. Newmarket is located in York Region approximately 50 km north of downtown Toronto. This central location between the bustling city and picturesque cottage country allows for a small town charm while providing big city amenities, such as premium healthcare facilities (Southlake Regional Health Centre), upscale shopping centres (Upper Canada Mall), and advanced transit networks (vivaNext rapid transit system). Its proximity to 400 series highways, affordable housing, and beautiful parks and hiking trails make Newmarket an ideal location for young families and professionals. Newmarket originated as an agricultural community, but quickly became a bustling centre for commerce and small industry. The name Newmarket evolved as a result of the trading that took place: York was the “old market,” and this new centre of commerce became the “new market.” The town offers extensive culture programs, public art initiatives, and heritage and history preservation projects, including famous and historic Main Street, Old Town Hall, and the Elman W. Campbell Museum. Offering established and growing businesses with access to highly skilled workers, Newmarket’s economic future is bright with a flourishing and diverse local economy. One key driver of the town’s economic prosperity is, and will continue to be, world-class healthcare. The future of Newmarket looks towards the growth of: business services, health sciences, information and communications technology, manufacturing services, and entrepreneurial and creative centres in historic downtown. Newmarket offers events that have become yearly favourites for residents and visitors: Winterfest, Kanata Day, Buskerfestival, and the Newmarket Music Festival. There are also over 45 active parks with a collective 800 acres of parkland in Newmarket. Family-oriented amenities such as picnic areas, trails, playgrounds, soccer pitches, ball diamonds, tennis courts, and basketball courts are found in various parks throughout the town. Newmarket is located approximately 50 kilometres north of Toronto, surrounded by numerous smaller cities and towns including Barrie, Innisfil, Bradford, Collingwood, Owen Sound, Gravenhurst, Orillia, Alliston, Tottenham, and Angus. As Newmarket’s commitment to the environment remains steadfast, updating your home with a set of new high-efficiency windows will dramatically increase your home’s value and comfort levels during all seasons. We appreciate your commitment to home maintenance and efficient energy use, which is why our team is dedicated to providing you with the best window replacement options for your home in Newmarket.